Lucy from the Pod Office shares her experiences of volunteering at the Bear Rescue project in Cambodia! It has been a few years since my last visit to Cambodia, and I was enthusiastic to revisit Phnom Penh – watching the sunset along the riverfront whilst sampling some of the tasty Khmer cuisine is a must on any Cambodia travel itinerary. The Bear Rescue centre is only an hours’ drive out of the city but feels worlds away, set amongst lush green rice fields. 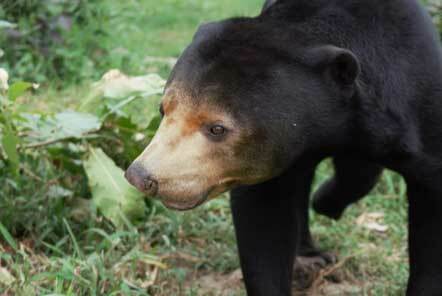 The centre is currently home to over 120 sun and moon bears, predominantly rescued from the pet trade and domestic homes. So far over 200 bears have been rescued thanks to the fantastic efforts of the Bear Rescue team! After their rescue, the bears are gradually integrated into life at the centre, eventually being assigned to a group of bears according to their personality traits. Unfortunately, the bears at the centre are unable to be released back into the wild. This is primarily due to rapid deforestation destroying the bears’ habitat and risk of being poached for the bear bile trade. However, the team are inspirational in their efforts to give the bears the most comfortable and natural life possible, being free to roam in outside enclosures with climbing equipment, trees and pools. What Bear Rescue volunteers get up to! Volunteers begin their work at 8:30am, the first daily task is preparing the bears’ breakfasts! The Bear Rescue team have carefully calculated the amount of fruit and vegetables each enclosure requires, this depends on the number of bears and their specific dietary needs. Fruit and vegetables (such as mango, cucumber, sweet potato, and avocado) are served with soya and mung beans to make a tasty feast! I really enjoyed learning this from experienced keepers who worked closely with the bears from their very arrival at the centre. Once the bears have been fed the next task is to prepare their enrichments, vital to ensure their minds are stimulated. We worked together to prepare a medicine ball enrichment, filled with banana, dog food (full of nutrients for the bears! ), jam and vegetable shoots. The enrichments are carefully placed around the enclosures, providing a challenge for the bear’s to find and encouraging their natural hunting instincts! They need a nap after their meal, and many volunteers do the same during their lunch break! Lunch at the centre is a tasty mix of local foods such as fried rice or noodles and is served whilst volunteers relax in a hammock. There is always plenty to do at the centre, in the afternoon volunteers assist in tasks such as preparing hammocks, maintaining enclosures and generally mucking in wherever help is needed! All of these jobs are a huge benefit to the bears. It was a busy, yet exciting day at the centre –and we were enthusiastic to continue to support the incredible work done by the Bear Rescue team the next day! We are looking for more volunteers to join this project and help the team in their efforts to care for the rescued bear population, you can find out more on how to get involved here.